Columbia University Press, 9780231129800, 312pp. 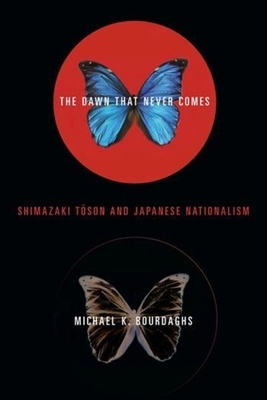 A critical rethinking of theories of national imagination, The Dawn That Never Comes offers the most detailed reading to date in English of one of modern Japan's most influential poets and novelists, Shimazaki Toson (1872-1943). It also reveals how Toson's works influenced the production of a fluid, shifting form of national imagination that has characterized twentieth-century Japan. Analyzing Toson's major works, Michael K. Bourdaghs demonstrates that the construction of national imagination requires a complex interweaving of varied--and sometimes contradictory--figures for imagining the national community. Many scholars have shown, for example, that modern hygiene has functioned in nationalist thought as a method of excluding foreign others as diseased. This study explores the multiple images of illness appearing in Toson's fiction to demonstrate that hygiene employs more than one model of pathology, and it reveals how this multiplicity functioned to produce the combinations of exclusion and assimilation required to sustain a sense of national community. Others have argued that nationalism is inherently ambivalent and self-contradictory; Bourdaghs shows more concretely both how this is so and why it is necessary and provides, in the process, a new way of thinking about national imagination. Individual chapters take up such issues as modern medicine and the discourses of national health; ideologies of the family and its representation in modern literary works; the gendering of the canon of national literature; and the multiple forms of space and time that narratives of national history require. Michael Bourdaghs teaches in the department of East Asian languages and cultures at UCLA. He is the translation editor of Kamei Hideo's Transformations of Sensibility: The Phenomenology of Meiji Literature.